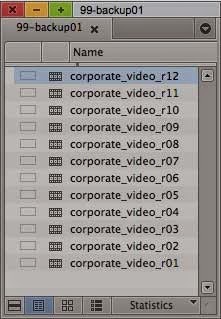 An organized video project requires consistent naming. If you've read my blogs in the past, you've gotten the idea that I'm a video editor. I write a lot of blogs about How to Become a Video Editor, but there's one trait that rises to the top if you want to be a good editor, especially in a collaborative environment. That trait is having good organizational skills. As I mentioned in Maintaining Raw Video Source While Editing, the best way to guarantee an efficient edit is to establish an organized workflow from the start. There are a handful of simple steps that will enable you to maintain an organized video editing workflow. This week we'll discuss what I believe to be the best and simplest ways to organize an edit. Name Your Bins - Although this sounds obvious, there too many editors who stick to the default bin names when editing a video. It's always a telltale sign of an unorganized editor when the bins are called "Project Name Bin", "Project Name Bin 1", "Project Name Bin 2", etc. Naming your bins is an easy first step in maintaining an efficient workflow. It's also a good idea to develop a consistent naming convention for bins across every project. I mentioned this strategy in Avid Editing Tips and Tricks - Part VIII, but it's worth repeating. When I build a project, I begin my bin names with a number to keep the bins ordered a particular way in my Project window. In every project I create, my sequences are ALWAYS in a bin called "00-sequences". This places the sequence bin at the top of the project window. 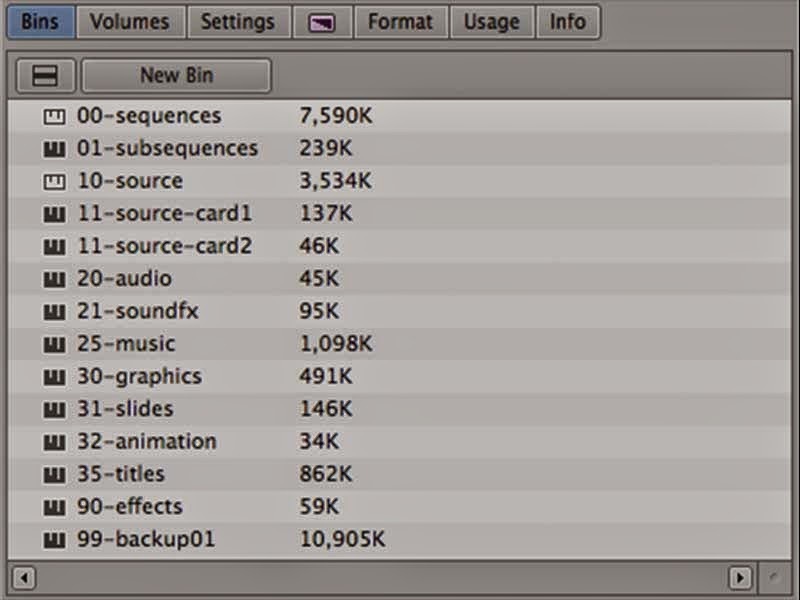 Organize Media Types by Bin - This idea goes hand in hand with naming bins. What good is naming your bin, if it doesn't help you going forward. Every bin in my project holds similar media types in the same place. As I mentioned above, all of my sequences go in a bin called "00-sequences", and only sequences go in this bin. I have separate bins for camera originals, graphics, titles, sound, music and so on. When naming bins, I alway increase the number by 10 for each different media type. For instance, camera source would go into a bin called "10-source" and audio would go into a bin called "20-audio". This allows me to add other bins into the order of the Project window like "11-source-card1", "12-source-card2", etc. Name Your Sequences - I know it's another obvious one, but you'd be surprised by how many video editors work on sequences called "Untitled Sequence.01". Generally, you want to name your sequences a name that makes sense to your client. Usually the sequence gets output for the client to review, if you name the sequence what the client expects for a filename on the approval copies, you'll save yourself the step of renaming each movie for review. The name should also include the current revision of the sequence - "corporate_video_r01". Backup Old Revisions of Your Sequences - Backing up old revisions of a sequence is a great idea. Never depend on the auto-save function as a way to get back to previous versions of the sequence. I have a bin in every project that holds nothing but backup sequences. I generally start every edit session by backing up the current sequence to the backup bin. That way if there's ever a problem, I can back to where I started earlier in the day. You never know when the client may come back and say, "I've changed my mind, can you put it back to the way it was two days ago?" All facilities are different and each has their own strategy for keeping everything organized. Having an organization strategy of your own, even if it's different than the facility where you're currently editing will allow you to more easily adapt to their way of doing things. Organizing an edit should never be an afterthought, it should be the core strategy of every video editing workflow.